Show your work on notebook paper. Record the final answers onto this sheet. Find the degree of the polynomial function. turns around, at each intercept. Find the y- intercept of the polynomial function. Find the zeros of the polynomial function. 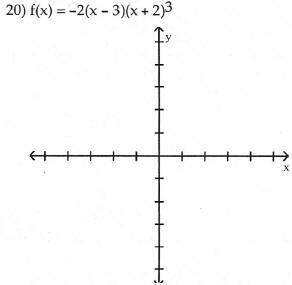 x-axis or touches the x-axis and turns around, at each zero. the degree of the function as small as possible. 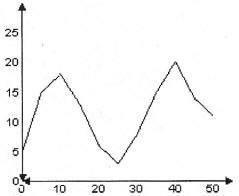 15) Crosses the x-axis at -4, 0, and 1; lies above the x-axis between -4 and 0; lies below the x-axis between 0 and 1. 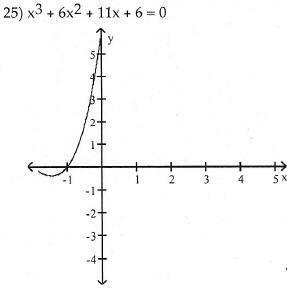 16) Suppose that a polynomial function is used to model the data shown in the graph below . Determine the degree of the polynomial function of best fit and the sign of the leading coefficient. The polynomial will be degree with a lead coefficient. Which of the following polynomials is the best model for this data? (a) Use the Leading Coefficient Test to determine the graph's end behavior. Divide using synthetic division . Use synthetic division and the Remainder Theorem to find the indicated function value . solution of the equation. Then solve the polynomial equation.